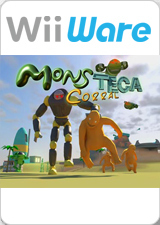 Monsteca Corral is a fast paced Action strategy game for WiiWare, created by Onteca, an independent game developer based in Liverpool UK. The object of the game is to engage in a variety of games and scenarios, Incorporating a growth/rearing element, design/construction, and multiplayer combat in a world populated by very large lifeforms: monsters and a race of Robots. The graph below charts the compatibility with A Monsteca Corral: Monsters vs. Robots since Dolphin's 2.0 release, listing revisions only where a compatibility change occurred. This page was last edited on 16 January 2018, at 12:02.